The Models 765M25 and 765M27 High Intensity Acoustic Sensors (Microphones) are designed for the measurement of gas-borne sound in industrial applications. These sensors have been constructed for use in corrosive environments that are compatible with the type 316 stainless steel diaphragm. The two designs differ only in their electrical connections. 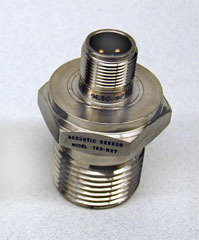 The Model 765M25 incorporates a miniature 10-32 fused-glass coaxial connector, and Model 765M27 provides a 2-pin connector interface. When combined with their all-welded construction, both units provide a true hermetic seal.